As part of the University’s £1bn Campus Masterplan, the school has undergone an ambitious refurbishment that brings all staff and students together under one roof to create some of the most modern campus facilities in the world. Ferco worked closely with the business school estates team and is proud to have installed seating solutions in five inspiring teaching spaces. In an increasingly diverse education environment universities and other higher education facilities are prioritising investment in their estates – according to Forbes contributor Christine Comaford, today’s generation of students want “to be mentored in an environment where they can advance quickly”, and where they “have the tools to win”. Collaborative learning has been shown to boost knowledge retention and it is becoming core to the education process. It is the mission of Ferco to provide the infrastructure to enable that to happen. Many studies indicate that where collaborative teaching methods are deployed, knowledge retention may improve from 15%–85%. Ferco works with universities and business schools to design seating which supports specific learning environments, providing a level of professionalism, helping to develop skills for life and the workplace. The Collaborative Wave™ is designed to allow both traditional lecturing and collaboration within a group. Ferco’s expert designers recognise that collaboration has emerged as a critical skill for today’s university students. With a pod of four or five comfortable office chairs on cantilevered arms, set around the unique curved desk, the Wave allows learners to seamlessly participate in tutor-to-student and student-to-student collaborative learning experiences through its innovative construction. The desk is 400mm deep – double the workspace of traditional lecture theatre desks. The curvature ensures all students can make eye-contact – an essential component of collaborative learning. A good seat is not a luxury. The Collaborative Wave™ provides seats that are comfortable and fit for purpose. The intelligently designed seats rotate to give a continuous line of sight of the lecturer and other students. The intentional flexibility of the pods allows the lecturer the opportunity to move alongside and behind students, improving interaction during teaching time. The market-leading FT10 seats were paired with a fixed writing bench and added modesty panels to create an impressive teaching space. It’s a luxurious executive-style seat designed with superior ergonomic and postural support. Comfort is important. All Ferco’s seats are ergonomically designed. 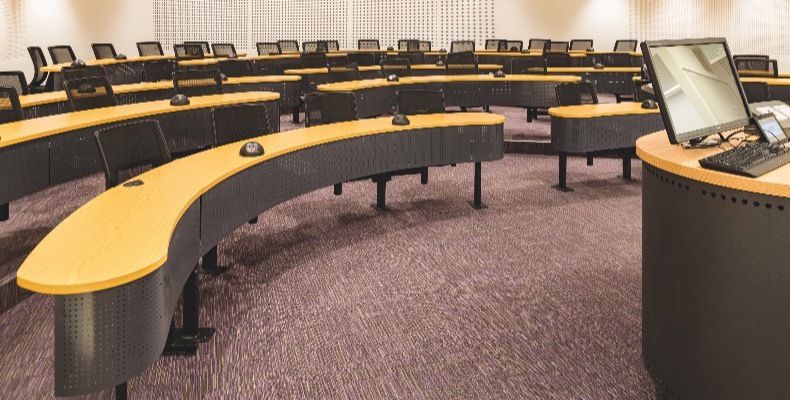 The ARC One Plus, a luxury upholstered seat with a high back rest and superior padding, was installed in a large lecture theatre. The tiered room required the seats to be paired with straight rows of desking, matching the acoustic panelling of the walls. The versatile ARC One with integrated A3 Wrimatic™ tablet was installed in a seminar room. Ergonomically shaped with a contoured back for lumbar support, it’s comfortable, functional and versatile for students sitting for extended period. Designed by an aeronautical engineer, the award-winning Wrimatic™ A3 is the ultimate writing tablet in size, function and strength – and is tested to a load bearing of 240kg, with almost zero repairs recorded in its 20-year history. Ferco has developed a CPD session on the benefits of collaborative learning styles and the place of fixed seating and are able to arrange guided visits around Manchester Business School on request.